We’re still all aglow from our recent Engagement – no date set just yet, but we’re getting there with the wedding planning. So much to think about! For Valentine’s Day, we actually celebrated at Ikea of all places. Our local store hosted a special event including salmon dinner and a bottle of bubbly for two, plus a wine and chocolate tasting in the bedroom department. All for $12. Total. For both of us. It was a no-brainer! …I mean, it’s Ikea. So, it wasn’t going to be a Five Star rated Salmon dinner. But it WAS super delicious, especially those green puff things at the top of the plate! As we were celebrating the holiday at Ikea, we decided to gift each other from the store. 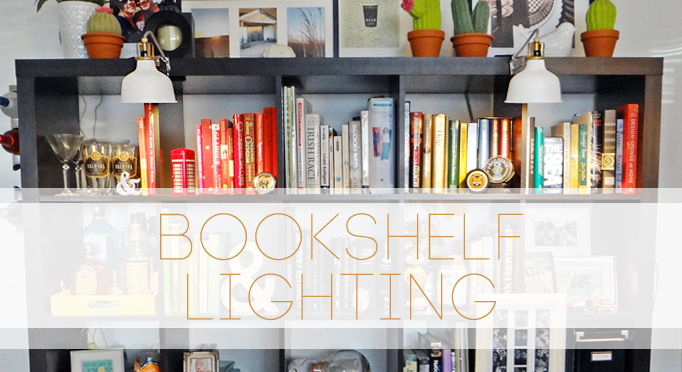 We had been discussing for a while how dark the side of the room with the bookshelf was, and I had even been looking around at potential small shelf lamps that would be more ambient. Then Ikea released these puppies, the RANARP (sounds derpy, no? ), and I knew they had to be ours. They’re this perfect shade of white – not 100% pure, but not creamy either. And the brassy colored hardware has a fantastic contrast, plus the cord! Is it weird to be in love with a cord? Black and white chevron! A fabric wrapped cord just makes these so new-vintage if that makes sense. Assembly was relatively simple, and the whole addition took a total of about 15 minutes. There are two options, either you can clip them on to the shelf like we have done here, or add an additional piece that makes the clips into a handy hinge allowing you to mount them to the wall and make them into wall lights that swivel. Would be a cute look for over a bed! They look FANTASTIC, and tie in our white bookshelf frame (bottom right), white Ampersand bookend, and a few other white accents too. In the background of the above photo, you’ll also see a slight update for summer – YELLOW. I picked up a few sprigs of faux flowers – the ranunculus are my favorite by far (hmmm…wedding flower maybe?). I liked the yellow with the milk glass. And the lantern! This was another find at Ikea. I just loved how cheery it looked in yellow. I mean, it’s just begging to be used on a table at a dinner party or something, isn’t it? And of course, when you think yellow, you can’t help but have lemons come to mind. A few vase filler lemons are strewn about, including in these vintage mason jars I scored at Goodwill for a total of $5 for all three! WOOHOO! So now we’re living the enlightened life and making lemonade with it. All in all, I’m diggin’ it. Have you ever found something and just had to decorate around it? Previous Post Good Housekeeping FEATURE?!?! Oh my goodness, yes! It just has worked out that I’ve never lived more than 45 minutes from an Ikea – even in college. And as Bill works closer to finishing his PHD and starts to look at potential Professor gigs, I’ve already told him one critical requirement – we have to be within an hourish drive of an Ikea. I mean, how else would have have cheap date night? I love that requirement in a job. 🙂 It leaves most of the east coast corridor open to you, right?